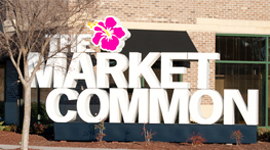 The new owners of The Market Common researched and found a design firm that had created beautiful signs for a similar project on the West Coast. Walcottai Design was contracted to design a comprehensive sign package after a site visit with the owners and Tyson Sign Company representatives. The entire team worked diligently with the City of Myrtle Beach officials to gain the necessary approvals for all of the signs needed to effectively identify this fabulous project that was hidden and poorly signed. 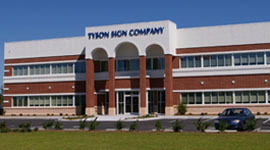 Tyson Sign Company was chosen by The Market Common to execute the production and installation of their signage and way finding package. This package included both on and off premise signs. 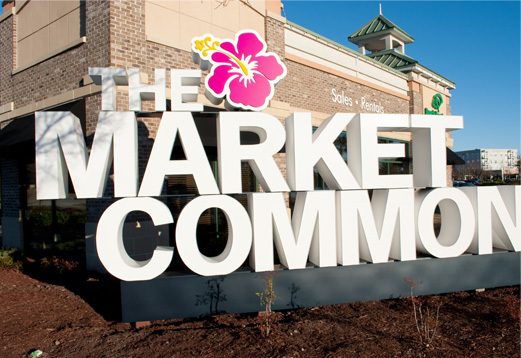 When entering The Market Common from either entrance you are greeted by a 20’ wide x 12’ high stacked logo sculpture that consists of fabricated 18” deep fabricated channel letters and push thru hibiscus flower. 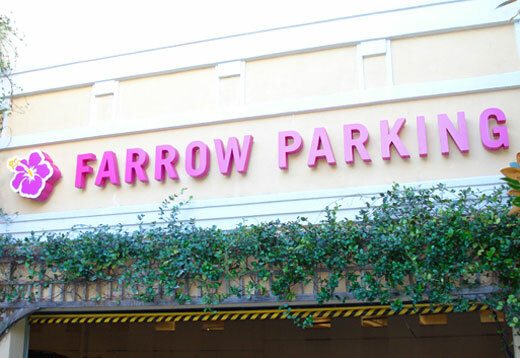 From the parks and ball field area, you can see mounted on the parking garage in the distance a set of forward and reverse lit channel letters. While in The Market Common, there are different types of way finding for both pedestrian and vehicular viewing. 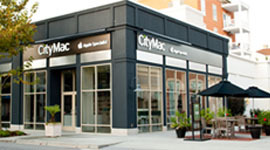 For the vehicular viewer there are directional signs that make the driver aware of the many broad offerings that The Market Common has to offer. These directional signs needed to be both attention grabbing for the driver but also fit in the landscape of The Market Common. 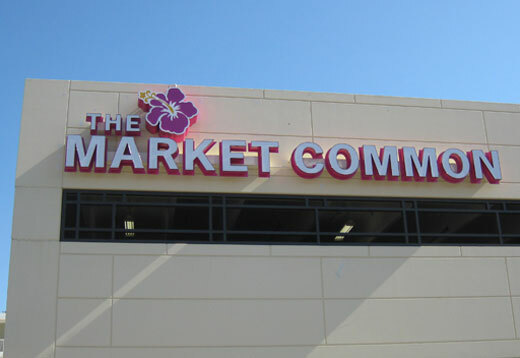 This was achieved with directional signs that include a hibiscus flower channel letter that extends past the cabinet, push thru letters for the “The Market Common” and panned panels for the information text that are easily removable in the event text changes are needed in the future. Also for the driver, there are unique and playful parking garage signs. 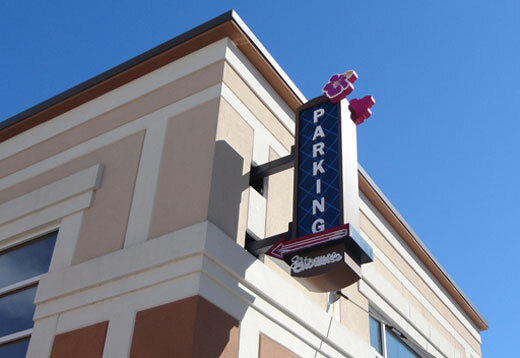 Located near the parking garage entrances are modern takes on vertical classic neon signs. 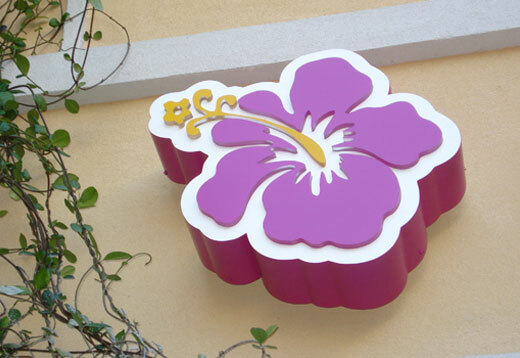 These signs include neon, push thru lettering for the hibiscus flower, channel letters and modern metallic paints. 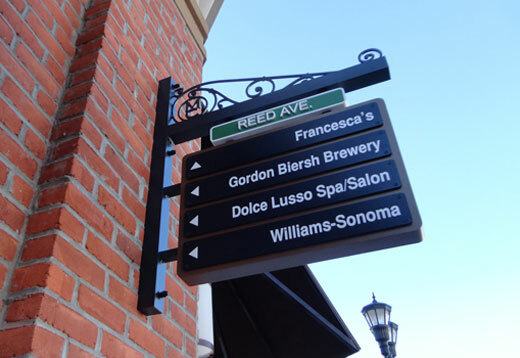 For the pedestrians there are directional signs that are fabricated blade signs with custom scroll work and layered panels and text to create a way finding solution with depth. 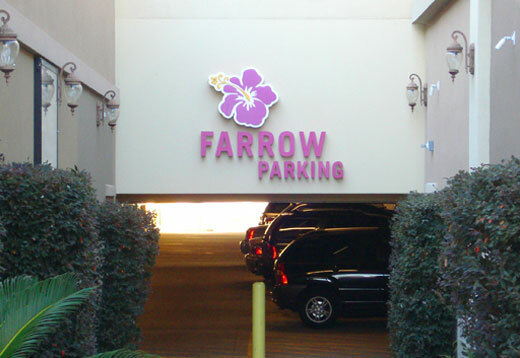 Also for the pedestrian, there are clearly marked main parking garage signs at pedestrian entrances with halo lit channel letters and push thru hibiscus flowers. Along with creating signage with in the property boundaries of The Market Common, Tyson Sign Company also installed channel letter sets for The Market Common on three of their offsite digital billboards. Tyson Sign Company, The Market Common and Walcottai Design came together to create a unique sign package that added visual excitement and helped solve the problem of wayfinding for the visitors at The Market Common.